The available Active Cornering Control AWD gives drivers improved traction and greater cornering capability in turns by transferring engine torque to the rear wheels and applying braking force to the inside rear wheel. The result is improved cornering performance and all-weather capability. 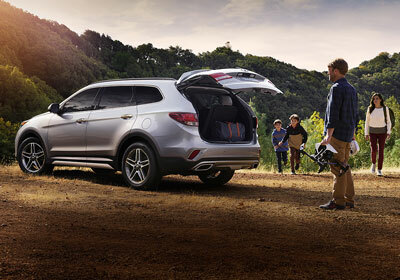 A product of Hyundai's design center in Southern California, the Sante Fe blends form and function. Its substantial visual presence starts up front with a newly redesigned look for the front fascia, headlights and grille then flows along the sides via the available premium silver-painted accents on the lower doors. The best designs offer tangible benefits that go beyond their good looks. Which is clearly the case with the Santa Fe. At the core of its distinctive style is an aerodynamic design that can help improve MPG. Case in point, Santa Fe delivers an EPA-estimated 25 Highway MPG. The standard 18-inch alloy wheels are sure to generate plenty of compliments. Now, if you’re ready to step things up, the available 19-inch alloy wheels are a new design. No need to kick or shuffle your feet to open the rear liftgate! You can automatically open it with this available feature by simply standing within three feet behind the vehicle for more than three seconds with the Proximity Key. The handy height-adjustable function allows users to stop the tailgate at various heights to avoid low overhangs. And with up to 80 cubic feet of cargo space you’ve got the room to bring along all of the essential gear you need for your next adventure. Drivers love Santa Fe’s available Dynamic Bending Light. It’s designed to turn the headlights with the direction of the curve as you turn the steering wheel. 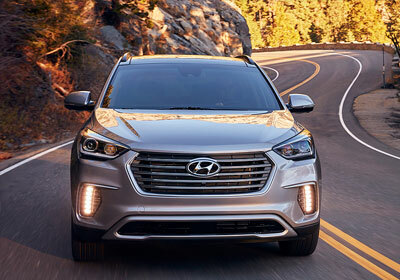 While other drivers on the road will appreciate the available High Beam Assist feature that automatically dims the Santa Fe’s high beams when it senses oncoming traffic. Second-row passengers get the unmistakable feeling of luxury from the available heated rear seats, integrated side sunshades and second-row seats that slide and recline. The second-row seats have added flexibility and functionality with their 40/20/40 split-folding design. * What about riders in the third row? They get an available USB charging outlet. Imagine having a 360-degree view around your entire vehicle. That’s the innovative idea behind the available Multi-view Camera System. It features four cameras that offer a 360-degree view around your vehicle. This system includes a forward-view cornering camera mounted on the front grille, two cameras incorporated into the side mirrors and a rearview camera. When the system is on, the driver initially sees an aerial view of the Santa Fe, then can select from front, rear and side camera views. All camera views are displayed on the central in-dash navigation screen at low parking speeds, the display then automatically switches back to the normal display. A 7-inch color LCD touchscreen and rearview camera are standard. This display controls an audio system with AM/FM/CD/MP3, HD Radio™ technology, SiriusXM Satellite Radio, plus built-in smartphone/USB and auxiliary input jacks. The available 8-inch touchscreen navigation system offers voice-recognition. And SiriusXM Travel Link® gives you updates on current traffic, weather, stocks, sports, even movie times, all in real time. 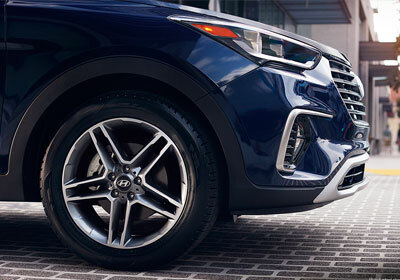 Every Santa Fe engine is mated to Hyundai’s 6-speed automatic transmission with SHIFTRONIC® with an overdrive lock-up torque converter for higher fuel economy at freeway speeds. To set this available feature, just pull the switch located on the center console near the shifter. When the available Electronic Parking Brake is set, it disengages automatically once the gas pedal is depressed. And there’s an Automatic Vehicle Hold feature that will engage the parking brake automatically after the brake is depressed, without your foot on the pedal.